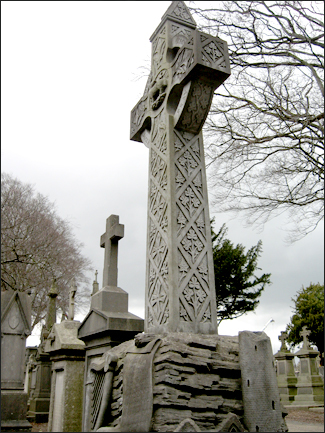 Officially known as Prospect Cemetery, Glasnevin is the largest non-denominational cemetery in Ireland. It spans 120 acres and over one million individuals have been laid to rest within its limits, beginning with Michael Casey of Francis Street, Dublin. Amazingly this one cemetery contains many of Ireland’s best known public figures, including statesman Daniel O’Connell, who achieved Catholic Emancipation in 1829, Home Rule proponent Charles Stewart Parnell, and Sir Alfred Chester Beatty, a mining magnate whose art collection is now housed in the magnificent Chester Beatty Library in Dublin. The history of “Ireland’s Necropolis” begins with the repressive penal laws. England’s conversion to Protestantism during Tudor rule left the problem of what to do with the neighbouring Catholic Ireland. In the early eighteenth century several new laws were passed discriminating against Catholics. Under the penal laws Catholics could not vote, were excluded from most public offices, could not be called to the bar and, of course, could not sit in parliament. These laws also placed restrictions on the public performance of Catholic services. As a result Catholics conducted their own services in Protestant cemeteries. 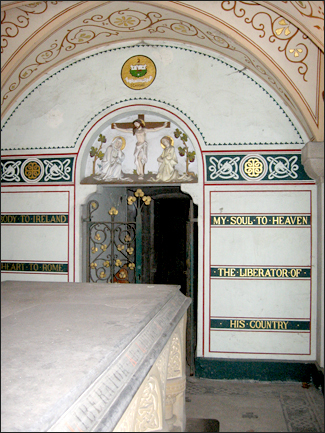 In the 1820s an incident took place at St. Kevin’s cemetery during which a Protestant sexton reprimanded a Catholic priest for only performing a limited version of a funeral mass. The incident provoked a public outcry and Daniel O’Connell, a Catholic who was able to practice law due to the Catholic Relief Act 1791, prepared a legal opinion to prove that there was no law that forbade praying for a dead Catholic in a graveyard. The “Act of Easement of Burial” Bill passed and nine acres at Glasnevin were bought and consecrated. O’Connell’s push for a cemetery where both Catholics and Protestants could bury their dead in dignity became a reality. But O’Connell is not the only noted statesman to be buried at Glasnevin. Also buried is Charles Stewart Parnell, who was president of the National Land League and leader of the Home Rule movement in the 1880s. Although his affair with a married woman caused his fall from political life, the “uncrowned King of Ireland” (a title also given to O’Connell) remains popular. 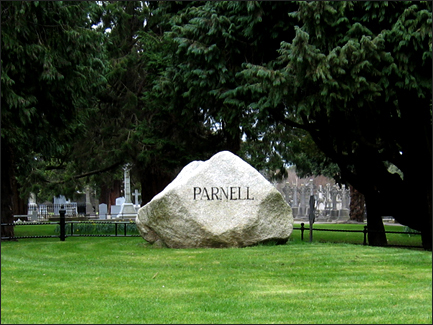 More than 200,000 people attended his 1891 funeral and in 1940 a gravestone of granite from county Wicklow was erected with just one word, “PARNELL”. 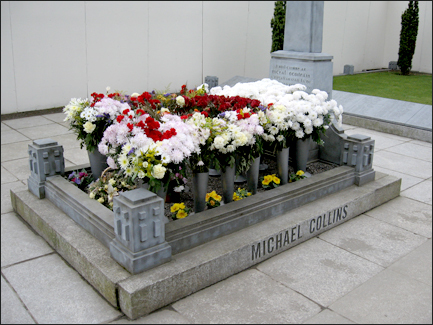 More recent burials include the famous Michael Collins, who fought in the General Post Office in the 1916 Easter Rising and was a member of the delegation who negotiated the Anglo-Irish treaty, his contemporary Eamon de Valera, author of the Constitution of Ireland and two-time President of Ireland, and Countess Constance Markievicz. Markievicz became the first woman to be elected to the British Parliament (in 1918), but in accordance with Sinn Féin policy she refused to take her seat. She was instead a member of the ‘First Dáil’ , established by Sinn Féin MPs elected to the House of Commons during the 1918 General Election, in which she was Minister of Labour. With the centenary of the 1916 Rising approaching, the cemetery is undergoing restorations and there are plans for a new heritage centre which will form a suitable introduction to the cemetery. 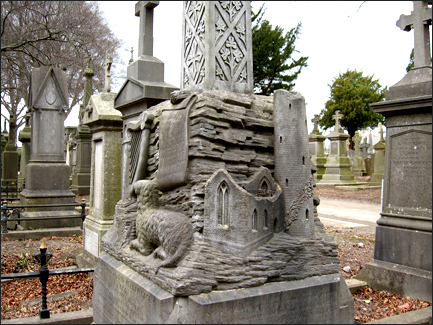 The Glasnevin website displays a virtual map and an index of notable grave sites. By clicking on the marker, those interested can read biographies of the deceased. 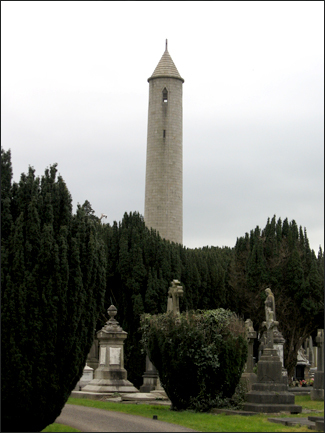 Few places offer such a deep connection to Irish history as Glasnevin. The cemetery offers daily guided tours at 2:30 P.M. for five euros. These tours last one and a half hours and are a wonderful way to learn some of the fascinating history of Ireland, and to admire the architectural artistry of the many monuments. Very interesting, and great pictures. There are some magnificent monuments there, and they’re well-preserved. Quite a contrast to our pioneer cemeteries. A place to bury your history…literally! even more interest will be generated when the heritage centre opens.